A slight improvement of my entry to a minigame competition, Bob-omb's Ice Game puts you in the roll of a bob-omb playing a variant of pool. In this version, you act as the cue ball, running around, bouncing off walls and exploding, attempting to send eggs into the holes at the edge of the ice rink. Some improvements over the original version include better collision detection for the bob-omb. 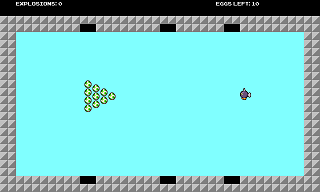 I remember playing the original version of this game at the Minigame Competition it was submitted to. It's a rather interesting concept, I'll say. Does this version expand the game or does it just improve on things? Mostly minor improvements. For example, I removed the fuse, legs and winch from the collision so the center is where it's supposed to be.